As it was originally written for Cinema Parrot Disco’s John Hughes Blogathon, this review has a different format from most of my work. 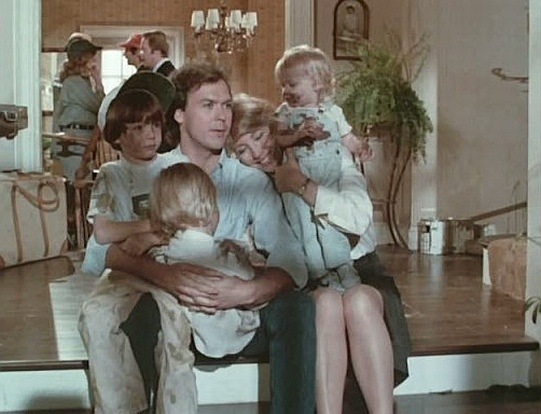 Jack Butler (Michael Keaton) loses his job. 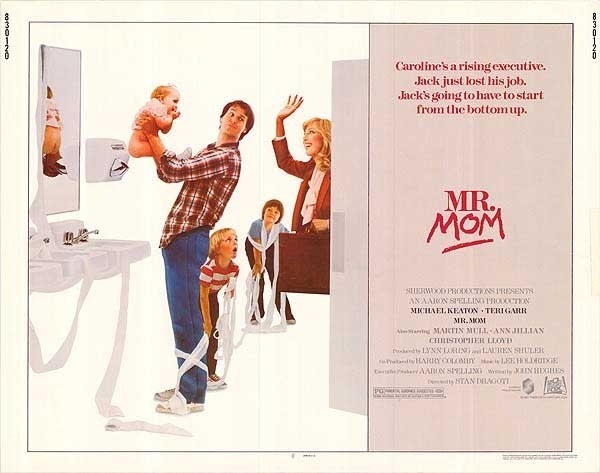 When his wife, Caroline (Teri Garr) finds work before he does, Jack stays home with their three children. Both Jack and Caroline must grapple with personal identity crises as they adapt to their new responsibilities. 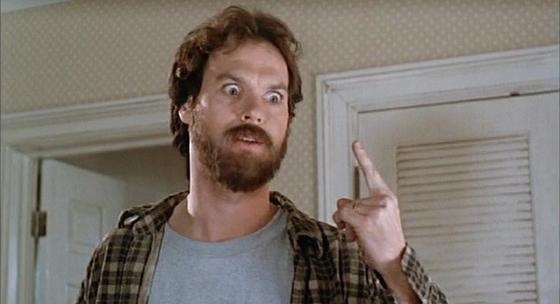 Humor is Mr. Mom’s greatest strength. Even after thirty-plus years, it is funny enough to maintain attention, not least because it features many quotable lines: “220, 221, whatever it takes;” “Well, you should take pride with some of that fat, porky;” “You can give me two. I don’t know what the hell I’m doing;” and more. Writer John Hughes and director Stan Dragoti deliver laugh out loud moments with such frequency that Mr. Mom never lags, never becomes less than entertaining. Humor is not the film’s only strength. In Jack and Caroline, Hughes and Dragoti develop two relatively complex lead characters. Both are believable and generate concern, facts that mean we can root for them and be happy when they finally start adapting. Their stories are not dramatic masterpiece material, of course, but they are soulful enough to give this comedy weight. Minor characters, like Joan (Ann Jillian), Ron (Martin Mull) and Jinx (Jeffrey Tambor) have only one note, but Mr. Mom does not suffer for their lack of development. Why? Because the minor characters’ purpose is to fuel humor, not to drive drama, and they are all very funny. As impressively, Hughes and Dragoti mark passage of time seamlessly and quickly, without ever resorting to cheap narrative tricks or lengthy exposition. They do not overwhelm their film with plot-filling montages, instead trusting skillful editing, simple dialogue and visual cues to fill in temporal gaps. Consider how we learn Caroline has found a job, or how we see Jack’s struggle to adjust to his new lifestyle. 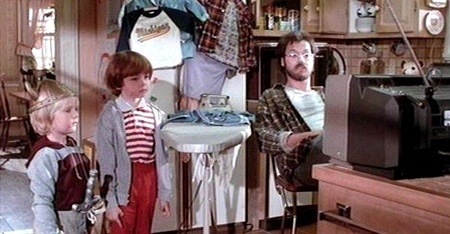 Mr. Mom’s performances are also very good. Michael Keaton is enchanting in this comedic role, using exaggerated gestures and facial expressions to deliver punch lines convincingly. Martin Mull is just as good as a sleazy boss with inappropriate intent toward to his female subordinate, and Teri Garr plays the comedy straight man well, providing just enough stabilization to support Keaton’s attention grabbing efforts. Yet, this film is not perfect. Chief amongst its flaws is that it has not aged well. Set aside the 1980s fashion, hairstyle and decorations. Consider instead the way Mr. Mom panders to sexist stereotypes. Men do not know how to shop the supermarket; women are scorned by executive work forces; housewives watch soap operas and mostly ignore their children; and so forth. 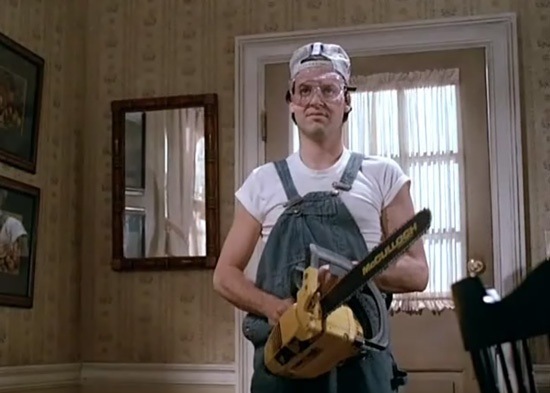 In 1983, Mr. Mom’s hyperbole no doubt effectively questioned society’s perceptions of gender roles, but in 2014, it isn’t so effective. If only because the modern world sees many men take active roles in households and childcare, just as many women now work in professional settings. We can still make more progress, of course, but today’s society looks different than 1983’s, a fact that makes Mr. Mom dated. Indeed, some of the film’s stereotypes are now borderline offensive. Additionally, Jack and Caroline’s children are under featured, explanations of their presence, activity and care ignored, leaving us to wonder exactly what is happening with or to them. The movie’s predictability is an even bigger issue. The moment Jack starts staying home, we know what is going to happen, both in terms of plot and character growth. Nothing in this movie surprises us. To be sure, Mr. Mom is funny enough that it doesn’t crumble under the weight of such conventionality, but a less predictable path would have served it well all the same. Yet, through humor, fun performances and interesting characters, Mr. Mom still overcomes most of its flaws. It remains an entertaining comedy. Yes, it has limited thematic application for modern viewers, but it is fun all the same. Despite some flaws, John Hughes’ screenplay vitalizes this comedy. The actors also help keep it lively. A young Keaton is actually something that I have never seen. This looks like it has potential to be hilarious. Maybe I should watch it sometime due to missing the sight of a good comedy! It is very funny. And Keaton is very good. Man where did you dig this one up from ?? 🙂 Never heard of it, but I love the 80’s and like Keaton so I will put it on my wish list. I actually saw it several times as a child. I thought it was one of the best comedies I’d ever seen. Upon rewatching as an adult, I wouldn’t go that far anymore. But it is still good. I am a bit surprised how many people from our generation (I think we’re around the same age) are unfamiliar with it. I thought it was one of Hughes’ better known movies, but several comments on T9M’s site suggested unfamiliarity with it as well.